This old blues tune has many variants [ with different numbers of bars ] and I'm not exactly sure where this 16 bar version comes from but the main thing here is to learn the riff. The main technique to get the riff sounding 'clean' is right hand damping. I use my index finger to pluck the note and the same finger plus my R/H thumb to damp the string being plucked and the strings below, - I'm sort of holding an imaginary plectrum so that when I push down towards the body of the guitar the thumb/finger combination completely deadens the bottom 3 strings. If you practice [ slowly to start with ] hitting a note then pushing down to damp you find that the damping movement becomes a natural part of the rhythm. Once you have the riff worked out with the damping at a slow tempo it should be easy to speed it up. 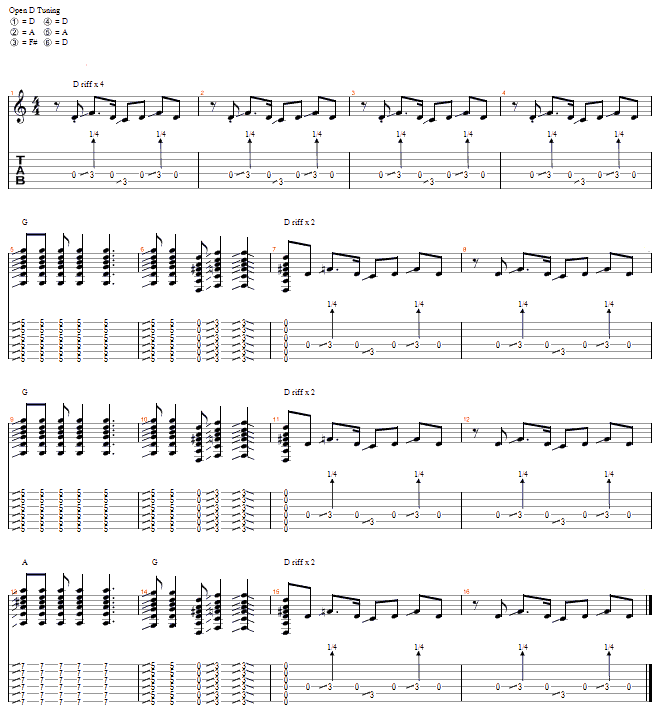 I have included a soundfile of just the riff at a slower tempo for you to play along with.